Skip my reel won't work. Every skipper dreads those words and they are not an unfamiliar cry for help aboard my boat Sundance. If it happens at the beginning of the day it's not a big problem because I can lend them a spare. 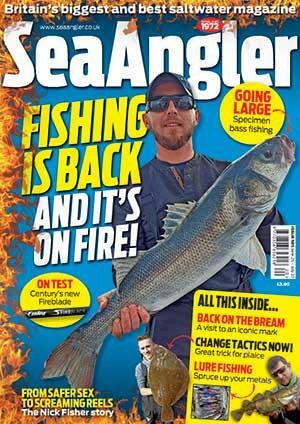 When it seizes up in the middle of fighting a fish, then the angler wishes he had looked after his reel. Boat anglers seem to fit into three categories. Firstly, there are some who maintain their equipment to the highest degree. Some even strip down the reel and clean it after each trip, and, as you might expect, get few problems. Secondly, there is the majority who give their reel a rinse off and perhaps a spray of WD40. Major maintenance will be an annual strip down or perhaps shipping it off to a service agent. Thirdly, are those who don't bother at all and leave a reel to seize up before doing anything to it. Unfortunately many of today's reels won't last long after this sort of abuse, although 20 years ago, when reels were built from materials that would withstand being covered with salt and incorporated bronze bushes instead of the ball bearings, you could get away with it. Bushes don't corrode and seize to the same extent and I have seen quite a few old Penn and Mitchell reels dunked in seawater by their owners to lubricate them enough get them going. What we forget about these older reels is the bigger tolerances on the bushes resulting in bigger gaps between the spool and frame, which allowed line to get down the side of the spool, something almost unheard of with today's reels. The downside to progress is that the reels now need more preventative maintenance. My preference is for graphite-bodied reels, which do not corrode, and lever-drag models that are easier to strip. I have had Shimano TLD 15s on my boats since the early 1990s and they are still going strong having landed tons of fish each. I fall into the second category of maintenance, giving the reels a wash off with a hose when back on land and occasionally a shampoo with soapy water and a spray over with WD40 when they are dry. I have experimented with a product called Salt-X and keep a plant sprayer on board to rinse the reels with a solution after use. It seems to be working and has kept down corrosion on the metal-bodied reels, but they still benefit from a light oily spray. The most common problems I get are a spindle end bearing rusting or a lack of lubrication on the main gear drive shaft. Here is the method to fix these problems on a TLD15. Most lever-drag reels are fairly similar but remember to lay the parts out in sequence as you remove them as this helps re-assembly. free-spool, screw on preset knob to required setting.